Let Us Be Your Wauwatosa, WI Fence Contractor! If you live in Wauwatosa, WI and are looking for an experienced fence contractor, call us for a free estimate. We have been in business since 1977! With a strong community of 44,798, Wauwatosa is a pleasant place to work. We’re often kept quite busy just before the Wauwatosa Beautification Committee is scheduled to come around, as competition for the annual “Yards of Distinction” award can get quite fierce. The committee does pay attention to professional improvements like fences, and residents take a lot of pride in their well-kept yards and landscapes. Landscaping brings up a lot of questions about trees. As fence contractors, trees often concern us deeply as well. For example, we often suggest that our customers plant trees and shrubs for attractive, landscape-enhancing road noise barriers. Wauwatosa itself follows a comprehensive urban forest management plan that helps combat the spread of common tree diseases like Dutch Elm disease. Find out which trees Wauwatosa favors here. Find out which trees will be planted on your street with this copy of Wauwatosa’s master tree plan. Like the rest of Milwaukee County, Wauwatosa also has to be especially careful to stay on the lookout for emerald ash borer infestations. This is a small wood borer beetle about the size of a penny. It can quickly destroy ash trees wherever it is found. The emerald ash borer often comes to our attention because it can hide in wild trees that grow along old fence rows as well as in ash trees or firewood that may be on your property. If you find an emerald ash borer infestation it’s important to get help as quickly as possible. Find a certified arborist in Wisconsin here. Find out about insecticide options for ash trees here. The Parks and Forestry Board will treat your trees themselves for a nominal fee. Call (414) 471-8420. 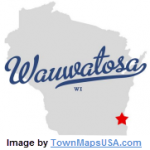 Since Wauwatosa maintains such a strong focus on creating an attractive community, they do require you to get a building permit before building or replacing a fence. There are many regulations governing fences in most communities. For example, Wauwatosa asks front yard fences not to exceed a height of 3 feet while allowing a 4.5 foot height in rear and side yards. You can look up additional requirements and find a building permit application here. If you are interested in having a fence installed in Wauwatosa, WI we can help. Call us today for a free estimate: (262) 251-6766.